Dog fleas- a menace, which has been troubling pet owners for millennia. The moment when you realize, “My dog has fleas!” is always frightening. It doesn’t count how clean or well-groomed your pooch is. If the conditions are right, fleas will hop onto your dog’s coat, and ultimately, crawl into your home. Fleas thrive best in warm environments. So when it’s summer and you’ve decided to take your dog for a walk outdoors, you should be wary not to bring fleas back into your home. In case your dog is already infected with these pesky parasites, here are a couple of treatment options to consider. First things first, is it Fleas? If you prefer monthly topical flea treatments, the Frontline Plus is your best chance at eradicating these pests. And the good thing is that it can be used on both dogs and cats. 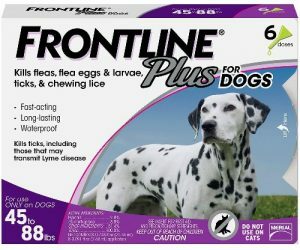 Frontline Plus is able to destroy all fleas hiding on your dog’s coat within a period of 12 hours. 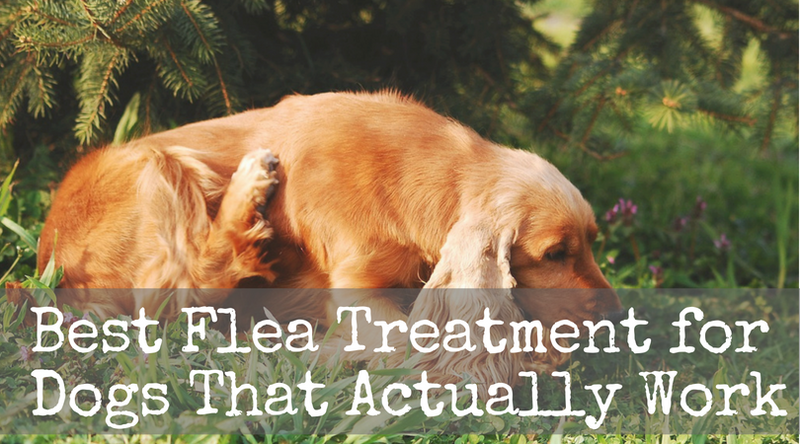 The way this treatment works is by regulating the growth of fleas. It’s formulated with S-methoprene, which is an insect growth regulator that kills adult fleas and their eggs. Another active ingredient present in this treatment is fipronil, a natural insecticide and slow-acting poison. Upon application, these primary ingredients get stored in your pet’s sebaceous glands and then they’re wicked out of the hair follicles and re-applied to the coat for a lasting effect. Beyond its fast-acting mechanism, Frontline Plus offers a ton of other benefits. For instance, it will keep your pooch protected from fleas for 30 more days after application. Also, this treatment is great for controlling sarcoptic mange infections. Giving your dog topical flea treatments is not enough. Some fleas could still get away by finding temporary hiding spots. For the best elimination, you should also bathe your dog in water treated with anti-flea shampoo such as Adams Plus. But this shampoo does a lot more than fight off fleas. It’s formulated with the best ingredients including oatmeal, coconut extract, aloe, and lanolin. All these compounds work hand in hand to make his coat shiny, clean and flea-free. Plus, apart from getting rid of fleas, Adams Plus creates a harsh environment where flea eggs cannot hatch for up to 1 month. This is beneficial because it disrupts the fleas’ life cycle; hence averting an infestation. Another plus of this anti-flea shampoo is that it can be used on puppies and toy dog breeds without causing any adverse effects. Are you looking for an all-in-one solution to destroy adult fleas as well as their eggs? This flea spray by Vet’s Best is one of the best options. The spray is formulated using peppermint oil and eugenol, which is an extract from the clove plant. These are all-natural essential oils that can’t cause any harm to your pet. And the good thing is that the spray does not contain cedar oil, which causes negative reactions in some dogs. But the crowning glory of this flea treatment is that it can be used on an array of surfaces. Sure, it’s meant to be sprayed on your dog. Nonetheless, you can also spray it on his beddings, exercise toys and sleeping area. Considering that it contains only natural compounds, it’s completely safe to use around your home. Also, the manufacturer asserts that it does not leave any stains. The only caveat to Vet’s Best Flea Spray is the need to reapply it. Since it wears off after awhile, you will have to reapply it within 24 hours if you want the effects to last longer. If you have ever purchased a flea collar from your local pet store, it’s likely that you were very frustrated with the results. While many of these collars claim to be 100% effective, only a few of them perform as advertised. The worst bit is that these collars only repel fleas around your dog’s neck region. So if you look more closely, you might still notice fleas hiding in his coat. 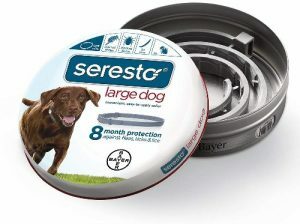 The Bayer Seresto is a flea collar that will never disappoint. Although it’s only worn on the neck region, this collar is capable of repelling fleas from his entire body. And not just that, this flea collar remains effective for up to 8 months. Bayer Seresto works using a unique sustained release technology. This enables the collar to release ingredients gradually during the next eight months. With this tech, the flea-repelling ingredients are dispersed to the dog’s hair and skin, creating an inhabitable place for fleas and ticks. The two primary ingredients responsible for keeping these parasites away are imidacloprid, whose function is to kill fleas and their larva. The second is flumethrin, which repels and destroys any living tick. It also kills tick larva and eggs. Just because your dog is scratching himself does not necessarily mean that he has been infected by fleas. It could be ticks or an underlying health problem. For instance, if your pooch is scratching his ears, this could be an indication of fleas or ear mites. And if he’s scratching his entire body, high chances are that he’s experiencing an allergy or other irritation. To be sure that fleas have attacked your dog, you should inspect his coat carefully. For one, fleas are tiny; about half the size of an apple seed but as big as a rice grain. They’re a type of jumping insects and have laterally flat bodies. But they have no wings. If you can’t find any flea, look for traces of flea poop. Flea poop can also collect on your dog’s coat, which resembles tiny particles of dirt. ​Many dog owners find it hard to get rid of fleas from their dogs. They try so many treatments but within a couple of days, the fleas are back. But with the flea treatment options reviewed above, you can never go wrong. These treatments not only destroy the parasites but they also protect your pooch for one or more months. 3 First things first, is it Fleas?